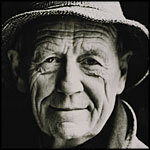 Today I'd like to introduce you to Irish author, William Trevor. On May 24, he will be celebrating his 83rd birthday. He was born in Mitchelstown, County Cork, Ireland. Coincidentally my great grandmother was from County Cork as well. Hmm... I wonder! He graduated from Trinity College in Dublin with a degree in History, worked as a teacher and sculptor until becoming a full time writer in 1968. He emigrated to England in 1954 and today resides in Devon, England. His first book, written in 1958 "A Standard of Behavior" met with little success, however after writing short stories, his next book "The Old Boys" won the 1964 Hawthornden Prize for Literature. He has won a number of prizes over the years for his works including the Irish Times Irish Literature Prize for Fiction, Whitbread Book of the Year, and Man Booker Prize for Fiction in 2002 for "The Story of Lucy Gault." "a master of capturing those small shifts in consciousness that shatter someone's world. Because he's an Irishman living in exile (Trevor has lived most of his long life in England) and because so many of those aforementioned epiphanies take place oh-so-discreetly, the comparisons to James Joyce have been inevitable. But as the 48 recent stories in this volume attest, Trevor has a more developed taste for the macabre than Joyce ever did. It creeps up on a reader slowly: the awareness that so many of these tales are about being trapped, buried alive, thwarted at every turn of life's labyrinth. And, yet, the signature response of Trevor's characters to their bricked-in situation is a fatalistic shrug garnished with Black Irish humor." "I think all writing is experimental. The very obvious sort of experimental writing is not really more experimental than that of a conventional writer like myself. I experiment all the time but the experiments are hidden. Rather like abstract art: You look at an abstract picture, and then you look at a close-up of a Renaissance painting and find the same abstractions." Because I find them dull. Heroes don’t really belong in short stories. As Frank O’Connor said, “Short stories are about little people,” and I agree. I find the unheroic side of people much richer and more entertaining than black-and-white success. Read the whole interview here for more insight into William Trevor, his writing, Irish writers and heroes, politics and more. It's rather insightful. For more information on William Trevor, his book list and a critical perspective, go here. I love your weekly posts...I always forget to tell you that. I've been enjoying your alphabetical journey this year and reading about books with which I am unfamiliar. This has been such a wonderful challenge, and I wanted to thank you for hosting it each week! Sounds like an author I need to look up! He sounds like an interesting Author--thanks for making me aware of him. I read "Horns" by Joe Hill. This is the same Brian that posted a few times with links to a blog called Books Infinitum. My reading seemed to be heading in a certain direction, so I've launched the more aptly named Ominous Books. @bookdragon- sound like interesting books. @Harvestmoon - glad you are enjoying yourself. @Leah and Kay - Hope you enjoy his writing. @Brian - Cool. Will be by to check out your new blog. William Trevor sounds like an interesting man. I'll have to check out his work. So I'm a little late signing up but I did read last week.